ScotSpirit Breaks, a scheme coordinated by VisitScotland and the Family Holiday Association, was launched last year to help families on low incomes enjoy a much-needed getaway. 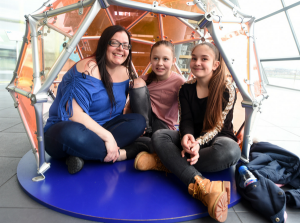 Click image to find out how mum Lisa, daughter Kacey and her pal Makenzi (centre) enjoyed their ScotSpirit break. This year, the number of families getting a holiday through the scheme was up an amazing 67 per cent, with the number of firms donating accommodation, transport, meals and entry to visitor attractions more than doubling. Some 420 struggling families have received a vital break in Scotland through the project. It’s meant more than 1600 people were able to experience a short holiday. One in three Scots are unable to take a break each year. With more than 250,000 children in Scotland living in relative poverty, something as simple as a short break or day trip can be life changing. This is how the Scottish press have reported the story. The families were referred by professionals such as teachers, social workers or health visitors. Many of them face tough challenges such as health problems, inadequate housing or domestic violence. Two-thirds of the families who were given a break said they had never had a holiday together before. Almost all of them said they felt able to cope better afterwards. Most importantly, they all said they had fun with the kids and created happy memories. John McDonald, director of the Family Holiday Association, said: “To see so many more families experience a life-changing break is a fantastic achievement and one we are very proud of.